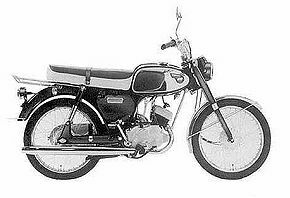 The Kawasaki G1 was a street motorcycle manufactured by Kawasaki from 1970 through 1972 and was nearly identical to, and did replaced the 90cc Kawasaki J1. The 90cc rotary valve engine produced 8.2 horsepower at 6500 rpm and featured a rotary 4-speed gearbox with disc valve induction and stainless steel fenders. Variants of the G1 were the G1L, G1DL, and G1TRL and were nearly identical. The G1 has no Superlube System. The GlDL has an electric starter. The GlTRL is the trail version.